Ranch-Flavored Tuna, Nutrition Labels of the Future, Life-Saving Fiber News & MORE! 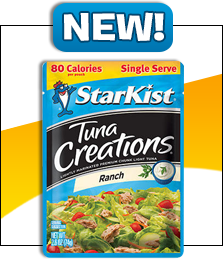 StarKist Ranch Tuna Creations - We got a sneak taste of this a few months back, but it wasn't available everywhere until now... It's RANCH-FLAVORED tuna! A 2.6-oz. pouch has 80 calories, 2g fat, 380mg sodium, 1.5g carbs, 0g fiber, 0g sugars, and 14g protein (PointsPlus® value 2*). Lunches and snacks just got a whole lot more delicious. Click for an HG recipe! Special K Flatbread Deluxe Egg & Cheese Breakfast Sandwich - Last year, Special K launched its line of fancy frozen b-fast sandwiches, and now the brand's debuting this future-classic variety: just eggs and cheese here! Each frozen sandwich has 190 calories, 8g fat, 580mg sodium, 22g carbs, 3g fiber, 4g sugars, and 8g protein (PointsPlus® value 5*). Check out the other options too! Garden Lites Zucchini Marinara, Zucchini Portabella, and Veggies & Cheese - We love Garden Lites' soufflés. (You know this!) And we've recently fallen for these non-soufflé veggie dishes. They rock! Each 7-oz. bowl has 110 - 180 calories, 4 - 7g fat, 390 - 650mg sodium, 18 - 21g carbs, 4g fiber, 3 - 9g sugars, and 3 - 8g protein (PointsPlus® value 3 - 4*). They're not always easy to find, but they're 100 percent worth chewing. 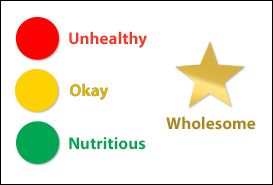 Could "Gold Star" and "Traffic Light" Food Labeling Be Effective? Survey Says: Yes! Confusion is common in the world of "what's good for us and what's not?" at the grocery store. And several food companies and supermarkets have been trying to demystify labels by applying gold stars (marked on wholesome picks) and traffic-light-style markings (green for the nutritious stuff, yellow for okay options, and red for unhealthy items). But do these techniques work? A recent study specifically looked at the cereal aisle, and found that the special labeling increased demand for the gold-starred (healthier) breakfast foods. And a report on the color-coding system used in Massachusetts General Hospital's cafeteria found that "green" items sold better than "red" ones among consumers who noticed the symbols. We LOVE this whole concept and, frankly, anything that helps people make smarter choices. A few extra tips from us, since these coding systems aren't everywhere yet... Watch out for food fakers (click here to read more on the deceptive items), don't be fooled by "health halo" phrases (for example, thinking gluten-free foods are inherently healthy or good for weight loss), and always remember to look at the serving size AND servings per container! Fill Your Cart with Green Lights and Gold Stars! With October officially behind us, more seasonal flavors are marching our way! 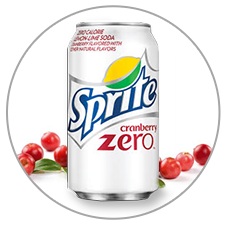 Make room in your life for Sprite Zero Cranberry, with its snow-white can and sweet-tart taste! Yummm... ***HG POLL ALERT: We're working on an app that would be available as a supplement to the Hungry Girl diet book (coming in March)! Tell us what features you'd like it to have. PLEASE click here to answer three quick questions... Thank you! ***Unless you've been living under a rock (no offense to stone dwellers), you're probably aware that fiber is important to your diet. Well apparently, it could even help save your life! New research from the American Journal of Medicine shows a significant connection between low intake of dietary fiber and increased cardiometabolic risks (like metabolic syndrome and obesity). Now might be a good time to take a look back at these fiber-ific items... ***Tune-in time! Catch HG Lisa TODAY (Monday, 11/4) on The Doctors. She'll show you how to save TONS of calories with recipes for comfort foods like stuffed French toast, taco pizza, meatloaf, and MORE. Click for show times! ***Lastly, we've long been fans of making tiny art projects out of the wax that encases our beloved Babybel cheese. From the looks of it, we're not alone! Click here to see why BuzzFeed dubbed Babybel wax "The Ultimate Artistic Medium." Maybe art-supply stores ought to rethink their marketing strategies... Pastels + Popchips? Clay + cookies? (Er, maybe not.) And that's all we've got. HG out! Pass around the News while it's still new! Click "Send to a Friend" now. Today, November 4th is... National Candy Day. Really? That wasn't last Thursday, a.k.a. Halloween? If you're looking to make your leftover candy count, check out these snazzy recipes!